It is with great sadness that the family announce the passing of Dougald Thealo Bolivar, 82, of Buckfield, Queens County who succumbed to the late stages of dementia. Born in Chelsea, he was a son of the late Livingstone and Mildred (Bolivar) Bolivar of Bridgewater. Dougald started his career in various accounting positions and then decided that suits were not in his future and chose work clothes, a hard hat and a pair of Greb boots. He worked many years as Superintendent of Construction for Mosher and Rawding. Once he retired from this company, he worked with his son, Brian, a general contractor, for a brief time. He then went to Bowater Mersey Paper as Assistant Superintendent of Millwrights until his second retirement. He completed two further consulting jobs for Bowater’s before his third and final “retirement”. Dougald never truly retired and continued to work tirelessly helping others when in need. He was passionate about his family and assisting others, never seeking anything in return. Dougald is survived by his wife of 58 years, Marion (Payzant), Buckfield; Brian (Rika), Liverpool; Brenda (Armand Heintz), Calgary; Pamela Mansfield (Wayne), Milton and Patricia (Kirk Long), Kentville; many grandchildren and great grandchildren. His sister Judy (George) Jensen, brother, Milledge (Bonnie), and brother-in-law Robert Wile. He is predeceased by his sisters, Sylvia Wile, Fayette (Joudrey) and her husband, John “Sonny”; and brother, Temple and his wife Kaye (Manthorne). We are sorry to read of Dougald’s passing. Our thoughts and prayers are with you all at this most difficult time. Please accept our condolences in the loss of Dougald,we have known you all for a lot of years.Our thoughts and prayers are with you all at this time. My thoughts and prayers are with you all at this very difficult time. We are so very sorry . Please except our deepest sympathy. I am sorry we are not at home at this difficult time for you. May you cherish the many memories made and know that Dougald will be missed by all. Marion, we are so sorry to hear of your loss. Our deepest sympathy to you and all your family. Dougald is in a better place. certainly miss seeing & chatting to him on the road. cottage & building new home. We are saddened to hear of your loss.Dougald was such a great fellow,always seemed to me,in good spirits. Our thoughts and Prayers go out to you and the family at this time. Dougald was a sweet , sweet man and will greatly missed by so many in the community ….His smile is something no one would ever forget . We are so sorry to hear of the passing of Dougald. He was a great man and will be missed by all who knew him. Love and prayers for you at this difficult time. Sorry to hear of Dougals passing.Thinking of you all at this difficult time. May you rest in Gods faithfulness,find strength in His promises and be comforted by His love. With Thoughts And Prayers for you all. Bonnie, so sorry to hear about your brother-in-law passing. I got to meet him one day when we went back the road where he was living at the time. He seemed like a nice fellow. Take care of each other, I often think about you both, fondly of course. Our deepest sympathy to you and your family during this difficult time. We always enjoyed our chats with Dougald and his great sense of humor. He will be missed by all who knew him. Our sympathies are with you. May Dougald rest in peace. We will always remember him with his great smile and helpful ways for all. So sorry to hear about Dougald’s passing, He was a worker, always had a smile & time to talk. My deepest condolences to you all may God give you the comfort you need to get through this valley. marion and family ; the loss of a man like Dougald is always a sad time for everyone ; peace and strength be with you all at this time . We will remember Dougald as a kind, caring and friendly man. He was always willing and ready to lend a helping hand where needed. May God’s peace and comfort be with you through this difficult time. Our thoughts, sympathy and prayers are with you. Marion, Pam and families – Please accept my sincere condolences on your loss. You are in my thoughts and prayers. Brian, so sorry on the passing of your father. He was an interesting man who was fun to know. Please accept our condolences at this very sad and difficult time. Prayers to Dougald’s family, he was a very kind man and will be sadly missed by everyone. It was an honor to know such a proud man. Brian and all of your family,our thoughts and prayers are with you at this sad time. To: Marion and family. Sorry to hear of you loss. My thoughts are with you at this time. His smile is my memory of Dougald…. I am thinking of you at this sad time and hope you will find comfort in your memories…..
Pam and family so sorry to hear of the loss of your dad, may all the fond memories keep him close to your heart allways. Marion, Brian, Rika and family, we are so sorry for your loss and thinking of you at this difficult time. Marion, Pam, and family. Our thoughts and prayers go out to you all during this time. Marion & Family:: We are so sorry for your loss. Dougald was a very interesting man & full of knowledge which he was willing to share ..He will be sadly missed by all who knew & loved him .Our condolences to all of you . Dougald’s talents were many but greeting those who entered our church with his broad smile, hugs and handshake will forever be my memory of this generous man! His humble and modest virtues made him so special. We are blessed to have known him. Thoughts and prayers to Marion and family! please except our condolences on the passing of dougald he was very nice man he always had a smile and was always there if you needed a extra hand. So sorry to hear of Dougalds passing Our condolences to Marion and family. Please accept our condolences at this very sad and difficult time.Our thoughts are with you all. So sorry to hear of Dougalds passing our thoughts are with you at this sad time. So sorry to hear of Dougald’s passing. Working with Dougald at the mill was always a pleasure. He was a dedicated worker and helped so many people. The area will miss him immensely. Please accept our condolences. I would like to extend heartfelt sympathy to the family of the late Dougald Bolivar. Marion, Brian,Rika and family! Thinking of you in your time of sorrow. God Bless you as you grieve his loss. So sorry to hear of your loss, but just close your eyes and look in your heart, he’ll always be there. I really loved the video. Please accept our sincere and heartfelt condolences on the loss of Dougald, a wondedrful man who took pride in all that he did. I will always remember his smile, so genuine and twinkling eyes. You have many wonderful memories and pictures, he will always be in your heart, R.I.P. Dougald , you so deserve peace. Marion, Brian, Brenda,Pam, Pat & Families. We are so sorry to hear of your loss .Dougald was a fantastic person, willing to help anyone. He will be sadly missed. your memories will help comfort you. Our thoughts are with you all. God bless. Heidi , Bettylou & The Boys. So sorry for your loss. Dougald is now at peace. Treasure all the great memories as they are yours to keep. Marion and Family, My thoughts and prayers are with you all at this difficult time. Sad to hear of Dougald’s passing,I had just looked at some pictures from back in 1974 with douglad standing looking down over a cement pour for the woodroom.He was full of knowledge and wasn’t scared to try some other ways if it were to be to his advantage.Remember all the fun times that you all had together.RIP Dougald . 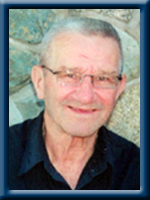 We were very saddened to learn of Dougald’s passing. He was a dear long time friend that we always enjoyed playing cards and socializing with. He was always so jovial and personable. He will be greatly missed. Please know that you are in our thoughts and prayers during this difficult time. Sorry for your loss. He was a hard working man. Dougalds’s visits to Ron while he was ill meant a lot to him. Marion and family I am so sorry to hear of Dougald’s passing. I just found out. Have known Dougald since I was 18 and I have always had great conversations when we met. Dougald had a hard battle the last couple years but he faced it and never gave up. He was never a quitter. I am so sorry and hope you will always remember the good times he had and enjoyed with you. Our deepest sympathy to all members of Douglad’s family. My father Cyril Leslie spoke highly of Dougald and seeing all the condolences he was surely right. This storm of sadness will pass and the sun will shine again with wonderful memories of your loved one. We are so sorry to hear of Dougald’s passing. Thoughts and prayers are with you all..
Sending our deepest sympathies to the Bolivar families. Hold your memories close at heart and take strength from one another to get through this hard time.. Deepest Sympathy on the passing of your father and grandfather. Our thoughts and prayers are with at this sad time. Treasure your memories. He will always be in your hearts. I will always remember Dougald for the kind, generous man he was. His love and care of my son Matthew was a special gift. I know Matt will be saddened by the loss of the man he thought of as Grampie. Love and best wishes to you all…. Sorry to hear of Dougald’s passing. I had the opportunity to watch over him while he was in Lunenburg, in my position as Security, for the hospital. At one point in my life, he was my boss (1979) – he was a good man and will be missed. Pat, so sorry to hear of your father’s passing. My deepest sympathies to you and your family. My thoughts and prayers go out to your family at this most difficult time. MARION/FAMILY. SO SORRY ABOUT YOUR LOSS. I WORKED WITH HIM ALOT. WE HAD A LOT OF GOOD TIMES TOGETHER. A FEW DRINKS AND ALOT OF LAUGHS.THOUGHT OF DOUGAL OFTEN. WAYNE/LINDA W.
Dear Brian and Family: Please accept our sincere condolences for the loss of your father.